Soon after the Big Bang, the universe went completely dark. The intense, seminal event that created the cosmos churned up so much hot, thick gas that light was completely trapped. Much later—perhaps as many as one billion years after the Big Bang—the universe expanded, became more transparent, and eventually filled up with galaxies, planets, stars, and other objects that give off visible light. That's the universe we know today. How it emerged from the cosmic dark ages to a clearer, light-filled state remains a mystery. In a new study, researchers at the University of Iowa offer a theory of how that happened. They think black holes that dwell in the center of galaxies fling out matter so violently that the ejected material pierces its cloudy surroundings, allowing light to escape. The researchers arrived at their theory after observing a nearby galaxy from which ultraviolet light is escaping. "The observations show the presence of very bright X-ray sources that are likely accreting black holes," says Philip Kaaret, professor in the UI Department of Physics and Astronomy and corresponding author on the study. "It's possible the black hole is creating winds that help the ionizing radiation from the stars escape. Thus, black holes may have helped make the universe transparent." Kaaret and his team focused on a galaxy called Tol 1247-232, located some 600 million light years from Earth, one of only three nearby galaxies from which ultraviolet light has been found to escape. In May 2016, using an Earth-orbiting telescope called Chandra, the researchers saw a single X-ray source whose brightness waxed and waned and was located within a vigorous star-forming region of Tol 1247-232. The team determined it was something other than a star. "Stars don't have changes in brightness," Kaaret says. "Our sun is a good example of that. "To change in brightness, you have to be a small object, and that really narrows it down to a black hole," he says. The quick answer is no one knows for sure. 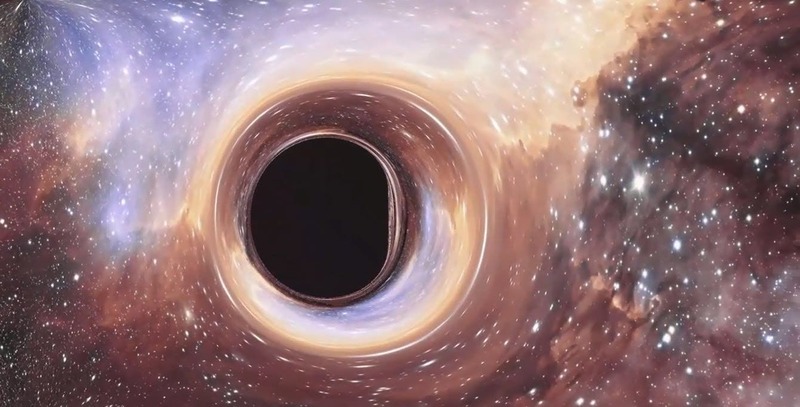 Black holes, after all, are hard to study, in part because their immense gravitational pull allows no light to escape and because they're embedded deep within galaxies. Recently, however, astronomers have offered an explanation: The jets of escaping matter are tapping into the accelerated rotational energy of the black hole itself. Imagine a figure skater twirling with outstretched arms. As the skater folds her arms closer to her body, she spins faster. Black holes operate much the same way: As gravity pulls matter inward toward a black hole, the black hole likewise spins faster. As the black hole's gravitational pull increases, the speed also creates energy. "As matter falls into a black hole, it starts to spin and the rapid rotation pushes some fraction of the matter out," Kaaret says. "They're producing these strong winds that could be opening an escape route for ultraviolet light. That could be what happened with the early galaxies." Kaaret plans to study Tol 1247-232 more closely and find other nearby galaxies that are leaking ultraviolet light, which would help corroborate his theory.